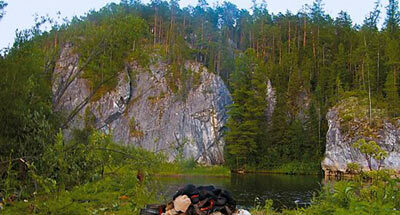 Zapovednik Pechoro-Ilichsky in the south-eastern Komi Republic was established in 1930. The Zapovednik acquired its present-day boundaries in 1959. The area is 721,3 thousand ha of which 6 thousand belong to a separate site on the right bank of the Pechora River near the village Yaksha. 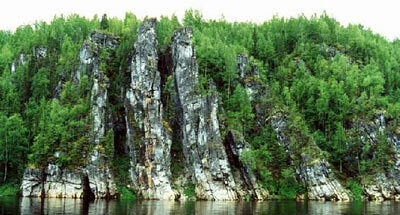 The Zapovednik is situated on the western piedmont of Northern Urals. It covers piedmont valleys, pied-mont and range systems with the highest elevation of 1280 m above the sea level. The relief features are diverse. In the valleys pine forests and mires prevail. The largest mire in Pechorscaya lowland Gusinoye boloto covers an area of 300 ha; peat layer thickness, 5-6 m. The foothills are occupied by dark coniferous forests of Siberian spruce, cedar pine and Siberian fir. Fir forests and spruce forests rise up to 500 m.
The sub-alpine zone is characterized by tall-herb and low-herb meadows; the alpine zone; by shrub formations and mountain tundras. The limestone and schist slopes of the Ilych valley support peculiar communities of petrophilous plants. The flora includes about 600 vascular plant species, including the following rare plants: Minuartia helmii, Schivereckia podolica. The flora and fauna are represented by European and Asian species. There are 40 species of mammals. Common are the moose, reindeer, wild boar, brown bear, wolf, wolverine, ermine, badger, common marten, Siberian weasel, chipmunk, squirrel. The muskrat has been acclimatized, and beaver re-acclimatized. There are over 200 avian species: black grouse, capercaillie, hazel grouse, big owls (eagle owl — Bubo bubo and great gray owl — Etrix nebulosa). At spring migration period different duck species are numerous. The following birds listed in the Red Data Book of the Russian Federation nest in the Zapovednik: the white-tailed eagle, osprey, golden eagle. The river fish are: the grayling, burbot, whitefish, ide; brook lamprey spawns, the upper reaches of the Ilych River is habitat of an isolated taimen population. The shallows of the Pechora and Ilych rivers are nesting grounds for the Atlantic salmon. The Zapovednik has one of the northern camps of the Upper Paleolithic and the biggest collection of Pleistocene fauna in the deposits of the Medvezhya Cave. There is an experimental moose nursery for the moose domestication of elk. 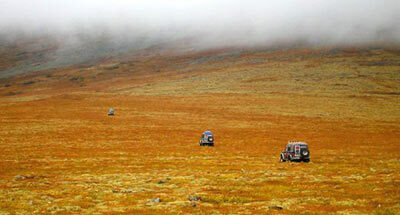 The Zapovednik has the biosphere status. It is under jurisdiction of World Convention for Culture and Nature Heritage Conservation. It belongs to the World Natural Heritage Site "Virgin Forests of Komi".